I’m opening my doors as a freelance copyeditor. 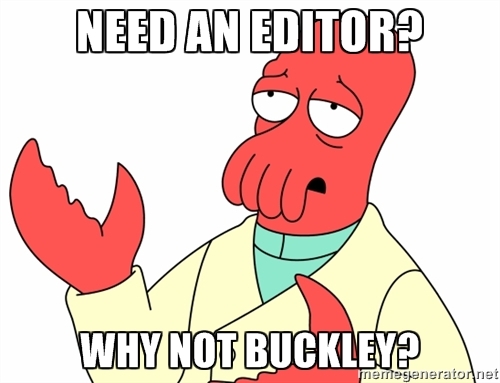 Why not hire Brian D. Buckley, freelance copyeditor? Tell your friends! Tell your readers! Lies will be corroborated, bribes reimbursed! In all seriousness, I am looking for work in addition to what I’m doing for Pen-L. If you do need a copyeditor (or know someone who might), I think I can do a pretty damn good job. I do free sample edits if you’d like to see how I handle your words. And I guarantee I will always treat you and your work with respect and professionalism. So anyone who would care to spread the word, or post a link to my editing site somewhere, it would be greatly appreciated. Wishing you well in your new venture.